All the official league club sites are now part of a network, and have a similar format. On payment of an annual fee, you can subscribe to "Pools Player", which gives you extra content including live match commentaries. It has all the usual club-site stuff, and is updated every day, even if much of it is advertising (especially for betting) masquerading as news. The gigantic BBC website even has a Pools page, with news, live match reports, tables etc., and an online equivalent of what Ceefax offers. As local newspaper circulations have declined of recent years, they have tried to use their websites to increasingly show advertising, so don't be surprised if some play annoying adverts with sound, or delay showing a page until an ad has been shown, or ask you to register as the price you have to pay for reading online for free. The Mail went all brash and downmarket a few years ago, but the result was improved coverage of Pools, and a lot of action pictures. Now printed in Sheffield, with its Hartlepool operations now much reduced, it seems to be gradually merging into the Sunderland Echo. Similar Pools coverage to that of the Mail, but slightly less extensive. The good news is that its Sports Editor is a Poolie. The bad news is that it's based in Darlington, wherever that is. It has audio ads. Tyneside-based Sunday paper (produced by the Newcastle Evening Chronicle, with which it shares its website) covers Pools in a cursory fashion (if at all), and no better than the national press. These are generally run by Poolies who maintain them for the love of it. has been the main Pools message board for a few years now. It has a members-only posting policy, and consequently debate is less likely to degenerate into mindless abuse than it can on some message boards. is another forum like the Bunker that is fairly well used, and some posters appear on both, and is a reincarnation of the earlier "Into to the Blue" forum. is a locally run site which is part of a network of similarly formatted sites, which includes a bit of news, comment, and a lightly-used messageboard, but it doesn't seem to have done much since Pools dropped into the National League. is likewise yet another networked site that also seems to have gone dormant. 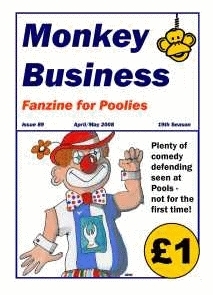 Is a gem of a Pools website with lots of stuff about Pools players old and new. If you ever needed to find out who Tommy McGuigan was signed from, what he looked like, and how many goals he scored in each of his 8 seasons at the Vic, this is the site for you, however, it, too seems to have also had updating problems. is really helpful for finding out how to get to away matches, where to park, drink etc., and even shows you pics of the ground, and warns you about uncovered areas etc.